Ok I will apologise in advance to anyone who might be offended by this but we all have different opinions right ??? Uggs, people say the haters are just jealous because they can't afford to drop the €200 for a pair, but no I hate Uggs because they are ugly, hence the name. And I'm not the only one who has this view, when Frank Mortel (the man who first made the Uggs) brought them home his wife called them ugly so he then named them Uggs as a joke. 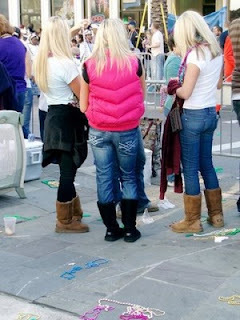 Uggs are completely shapeless and let's face it they don't flatter anyone. They look like you stuck your foot in a ball of dough. If you really have to wear these horrendous furry boots please only sport them at home or in the winter. For goodness sake, stop wearing your Uggs with your shorts and tank top in the middle of July! It makes no sense to have your feet stuffed in these sweaty sheepskin lumps. And worst of all, the world and their mother owns a pair of Uggs. Every girl between the ages of 10 - 30 wears them and they look like utter clones of each other. Uggs at like one of these crazy footwear crazes just like crocs and converse. I get the comfort argument but if its so important wear them at home only please. After all, comfort is overrated, a little discomfort probably means your clothes fit and you're not wearing pyjamas. Please let me know what you think of the infamous furry boots dolls ! I agree completely Kaithlin! They are just so common and I think that they cheaapen any outfit that you would wear! I only wear Uggs at home, cos it's always cold in my house!